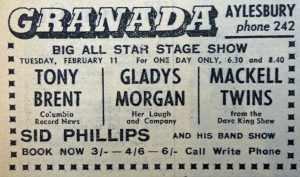 1958 saw the start of regular stage shows at the Granada Aylesbury. These often resembled variety shows, and might include a compere and comedians as well as musical acts. 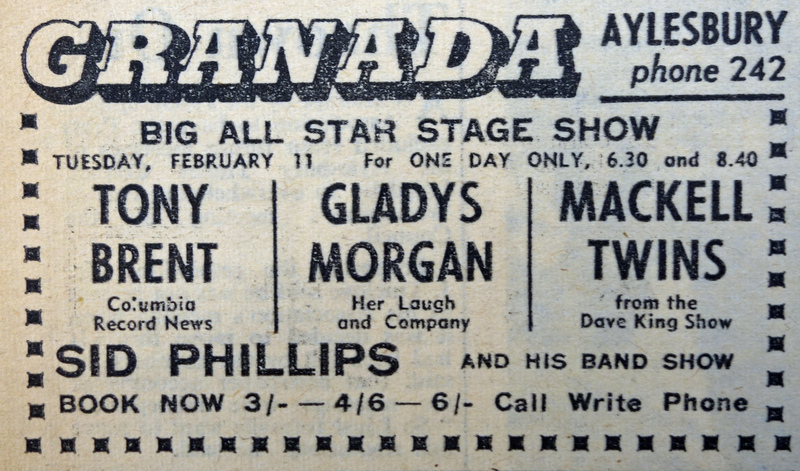 The packages generally toured a number of Granada cinemas (or theatres as they were correctly known) as “Granada One Night Stands”. 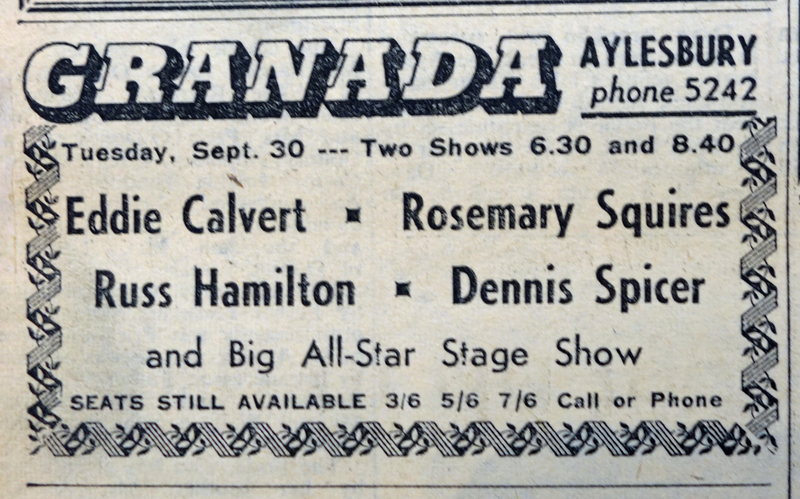 The removal of entertainment tax from live shows led to an increase in these shows, and in 1958 Aylesbury, along with a number of other towns, was added to the Granada circuit. There were two performances at each venue – at Aylesbury these were at 6:30 and 8:40 during 1958. 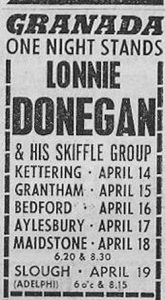 In 1958 there were six shows in Aylesbury. 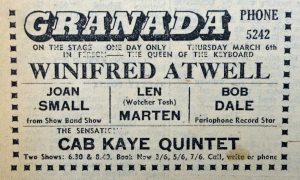 The first was on 11th February 1958, when Tony Brent topped the bill. Although not a well-known name today, Tony Brent had seven Top 20 chart hits between 1952 and 1959. Live theatre and variety (the professional kind) died in Aylesbury some years ago, after many sufferings bravely borne. 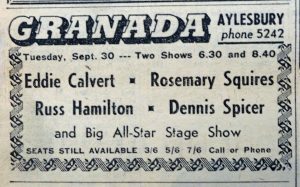 The corpse has been turned in its grave by occasional visits of “name” bands and stage personalyies, but the first real sign of a resurrection came this week when the Granada, Aylesbury, presented its All Star Stage Show. 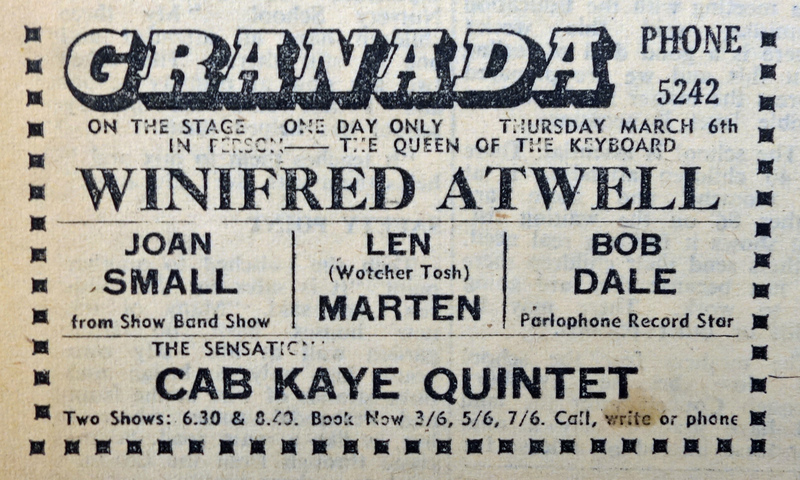 Next was Winifred Atwell, a popular Trinidadian pianist who was the first black person to have a number one hit in the UK Singles Chart with “The Poor People of Paris” (1956). Also on the bill was the Cab Kaye Quintet. 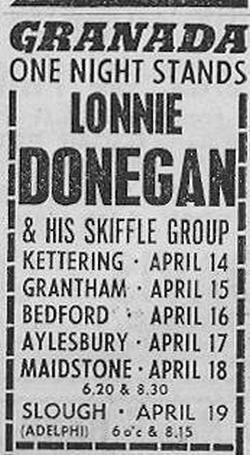 Lonnie Donegan was the first British pop superstar, and the founding father of British pop music, the musician who provided the original inspiration for John Lennon, Paul McCartney and a host of others … Donegan was a musical phenomenon. 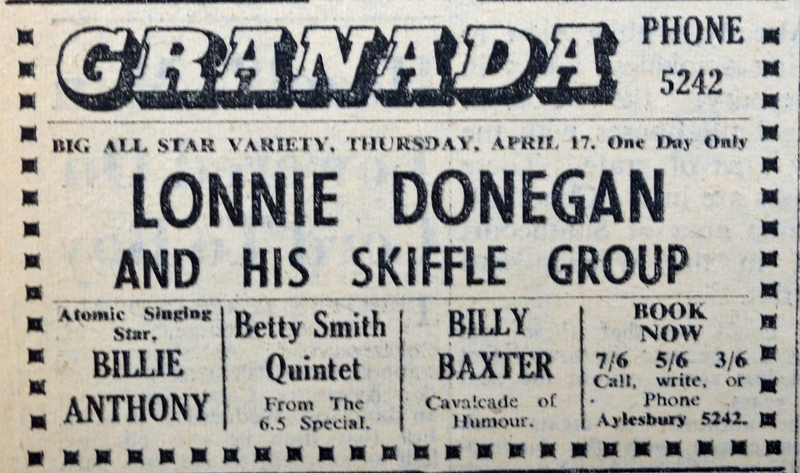 As the leader of the skiffle craze in the late 1950s, he inspired the formation of literally thousands of do-it-yourself bands across the country, and was directly responsible for the 1960s pop explosion. 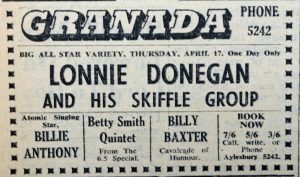 The next show saw more skiffle from the Chas McDevitt Skiffle group; Matt Monro was also on the bill. 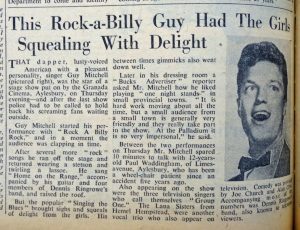 The Bucks Herald reviewer was impressed by the Chas McDevitt Group and “their attractive vocalist, Shirley Douglas”; McDevitt and Douglas were married in April 1959. The same Bucks Herald review also commented on “ex-London bus driver Matt Munro, who confessed to have lived at Leighton Buzzard, showed he knew the quickest route to the girl’s hearts by singing popular ballads in an easy style”. Monro had enjoyed some success, but at this time his career was languishing before he met George Martin and signing for Parlophone. 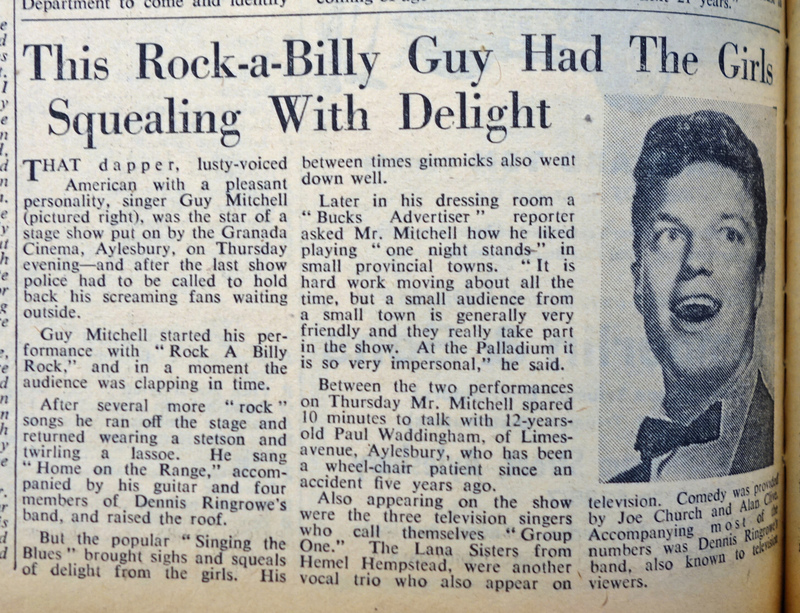 June saw Guy Mitchell as the headline act. The Bucks Advertiser review reported that “after the last show police had to be called to hold back the screaming fans outside” – see below; click on the image to enlarge. Also on the bill were the Lana Sisters, which included Mary O’Brien – who later went on to fame as Dusty Springfield. The name change came in 1960 when, together with her brother Dion O’Brien, they formed The Springields. Dion became Tom Springfield, and Mary became Dusty Springfield. This week and next our factories are closed for the annual holidays. Our presses are at a standstill. Large supplies of this record built up prior to the close-down have been exhausted and for two weeks you may have difficulty in buying Oriole CB. 1359 – which is, of course, Russ Hamilton’s ‘We Will Make Love’. We know that this disc will be a Number One… and it will be up there very soon after supplies start rolling again. But it was too late – Elvis hung on to the top slot, and Russ slipped down the chart to number 4 – with Lonnie Donegan’s “Gamblin’ Man / Puttin’ On The Style” climbing back to take the second spot (it had been number 1 in early July). But there was more success to come for Russ Hamilton in the U.S., where the B-side, “Rainbow”, reached No. 4 on the Billboard chart.